Akyab (Sittwe; 92.900E 20.147N) is a rice-milling and fishing port located on an island off the south tip of the Mayu Peninsula in the Arakan region of the west coast of Burma. It has an extremely pronounced monsoon climate in which vast quantities of rain fall in summer, while the winter months are virtually free of rain. The Mayu Peninsula is mountainous and jungle-clad, with its highest peaks reaching over 2000 feet (600 meters). The island of Akyab is located in the estuary of several small rivers and consists mostly of marsh and rice paddies. 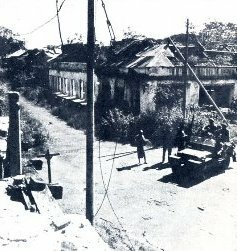 The British garrisoned Akyab in January 1942 with 14 Battalion, 7 Punjab Regiment, to prevent the Japanese using the airfield to bomb Calcutta. Two more battalions were sent in on 18 March, but were withdrawn after the Japanese occupied the Andaman Islands. Heavy Japanese bombing and malaria eroded the remaining garrison's morale, and they came close to mutiny before being withdrawn on 4 May. The island subsequently became the objective of two separate Arakan campaigns, the second ending with the reoccupation of the town on 12 January 1945. XV Indian Corps (Christison) planned a massive amphibious invasion by 25 Indian Division (Wood) and 3 Commando Brigade on 3 January 1945, supported by three cruisers and 200 aircraft of 224 Group. However, an artillery spotter could see no enemy activity on the island and landed his aircraft at the airfield, where local inhabitants confirmed that the Japanese had left. Christison cancelled the bombardment but had the landings go forward as a massive exercise.